As if Verizon didn't have enough budget phones for under $50, here's one more: the Nokia 2605 Mirage, set to launch December 5th for $49.99 (after $50 rebate with 2-year contract). The features are pretty low-end: VGA camera, 120x160 pixel internal display, and only supports the 1x network for downloads, but it does comes with a few Xpress-on snaps to change the external color of the device. We first heard of the 2605 back in January, and are surprised that it's took this long to come out. It makes us wonder when the mid-range 7205 is due. C'mon Nokia...make some high funtion phones. You're loosing American money (not that its worth alot) because of your lack of CDMA devices. Eh, I'll stick to Motorola. wow.. its like its 1996 all over again!! way to be retro nokia! now.. can we put away all the spare parts and bring good mid and high level phones to CDMA as well? actually #1, they make more off of the basic phones than they do the expencive ones. The basic ones cost a few pennies to produce and are sold by the truckload cuz anyone can afford them. make a $2.00 phone and sell it for 100 or make a $300 phone and sell it for $350-400. Which do you think they sell more of? Atleast Nokia makes decent junk even on the low end. This phone is tiny!!! Only 3.22" in height? Only 2.32 ounces??? The LG VX5500 is small and it's 3.6" x 1.8" x 0.7", 3 ounces. Wow! This is nice for someone who likes a very small phone that can makes calls and doesn't care about other options. I would get this if the reception and call quality is as good as the GSM Nokia phones. Unfortunately, the last VZ Nokia phone (Nokia 6205) didn't seem that good!! Actually... I've had excellent reliability and quality with my 6205. This is a scaled down version of the soon-to-be-released 7205..... not that it matters. The last truly good phone Nokia had with Verizon was the i6315. Very underrated phone during its time. Nokia rep told me that they are working on some higher end models for VZW, but wouldn't give me any details. My Jawbone rep is hot....... lol. sorry. off topic. 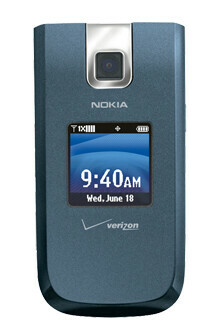 ugly phone, I don't understand why nokia stay 40% of markets .All have to do copy other phones and make them better. they don't have innoviations at all.